This page provides a video archive of presentations at the annual SSEP National Conference by student researchers whose experiments were part of the SSEP Mission 8 to ISS Kitty Hawk experiments payload. 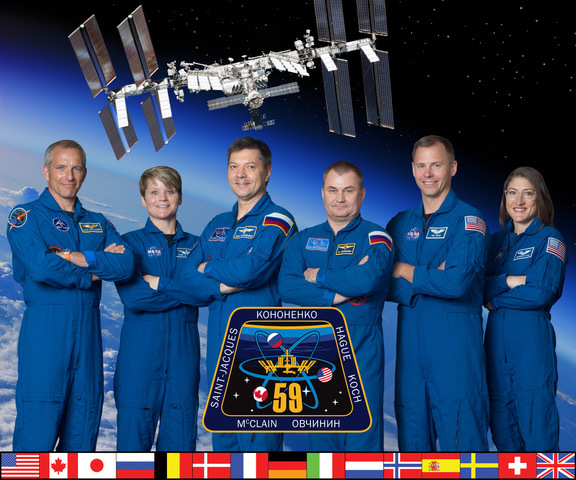 Mission 8 to ISS was the tenth SSEP flight opportunity. Kitty Hawk launched on SpaceX-9, 12:45 am ET, July 18, 2016, from Cape Canaveral Air Force Station, Florida. Kitty Hawk also returned to Earth on SpaceX-9, splashing down in the Pacific off the California coast, on August 26, 2016. For details on the flight profile for Kitty Hawk, see the SSEP Mission 8 to the International Space Station (ISS) page. Some student flight teams present at more than one annual conference, reporting out status at various stages of the life cycle of a flight experiment. It is also true that not all student flight teams attend a conference. For details on all Kitty Hawk flight experiments, see the Selected Experiments on SSEP Mission 8 to ISS page. Title: Will Microgravity Affect the Growth of Pleurotus ostreatus? Abstract: This experiment aims to explore the effect of microgravity on the growth of the saprotrophic fungus Pleurotus ostreatus, more commonly known as the pearl oyster mushroom. This fungus has been subject to much research. This highly nutritious fungus is grown in many countries and is consumed as a major source of nutrients. Differences in growth will be determined by studying the mycelial content in both samples. This research could be a step towards the production of food in space. 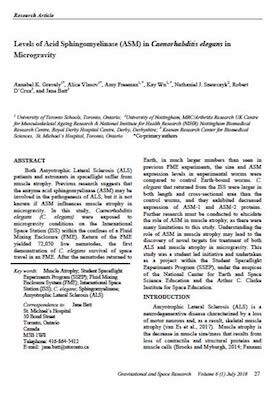 Abstract: Both Amyotrophic Lateral Sclerosis (ALS) patients and astronauts in spaceflight suffer from muscle atrophy. Previous research suggests that the enzyme acid sphingomyelinase (ASM) may be involved in the pathogenesis of ALS, but it is not known if ASM influences muscle atrophy in microgravity. In this study, Caenorhabditis elegans (C. elegans) were exposed to microgravity conditions on the International Space Station (ISS) within the confines of a Fluid Mixing Enclosure (FME). Return of the FME yielded 72,050 live nematodes, the first demonstration of C. elegans survival of space travel in an FME. After the nematodes returned to Earth, in much larger numbers than seen in previous FME experiments, the size and ASM expression levels in experimental worms were compared to control Earth-bound worms. C. elegans that returned from the ISS were larger in both length and cross-sectional area than the control worms, and they exhibited decreased expression of ASM-1 and ASM-2 proteins. Further research must be conducted to elucidate the role of ASM in muscle atrophy, as there were many limitations to this study. Understanding the role of ASM in muscle atrophy may lead to the discovery of novel targets for treatment of both ALS and muscle atrophy in microgravity. This study was a student led initiative and undertaken as a project within the Student Spaceflight Experiments Program (SSEP), under the auspices of the National Center for Earth and Space Science Education and the Arthur C. Clarke Institute for Space Education. Title: How will Microgravity Affect the Functions and Development of Stem Cells in S. Mediterranea Flatworm? Abstract: We devised a plan to examine the effects of placing a sexual and asexual species of Planarian flatworm, known as Schmidtea mediterranea, under microgravity. Planarians are capable of complete regeneration from any fragment of their body and have become essential in stem cell research. These organisms have unique genomic tools allowing for analysis of their regeneration process from a molecular perspective. Alteration of gravity can affect stem cell polarity, intercellular communication, and expression of related genes and processes essential to stem cell proliferation. Abstract: The purpose of the experiment is to observe the effect of microgravity on the water absorption of Hyaluronic Acid (Sodium Hyaluronate) to see whether the lack of gravity will have a positive, negative or neutral effect on the water absorption of Hyaluronic Acid. Water absorption and maintaining moisture are important in space because there is only a limited amount of water sources on the ISS and maintaining moisture levels in microgravity environments can help the astronauts’ daily lives. Abstract: The students from Chesapeake Math & Information Technology Elementary School in Prince George’s County decided to research hot peppers. We researched and discovered that hot peppers can fight bacteria. The purpose of this mission is to find alternative food sources for astronauts. If they can germinate hot peppers this could be used to help fight bacteria. This will keep astronauts healthy. We hope hot pepper seeds will germinate in a microgravity environment. This could be a new food source for astronauts. Abstract: This experiment investigates the effect of microgravity on biofilm formation on soft contact lenses. A biofilm is an assemblage of cells that adhere to a surface, held together by a substance they secrete. On contact lenses, they are harmful because they render any defenses useless. A type 3 FME that mimics a fluid processing apparatus is used. The bacteria used is Serratia marcescens and the growth medium is lactose broth. Biofilm formation on ground and experimental samples will be compared. Abstract: The purpose of this experiment is to observe how microgravity impacts the effectiveness of polymer beads when cleaning an oil-stained cloth. This is a major problem on the ISS due to the lack of water for washing clothing. On Earth, polymer beads require a minimal amount of water to be activated, expanding to trap stains. We will test our experiment in a microgravity environment and see how effectively the beads clean the cloth.